With advances in flying vehicles, automation, and electrification come the possibility of more convenience, enriching experiences, and major societal questions. The potential of mobility continues to expand thanks to advances in automation, flying vehicles, and electrification. The changes unfolding could shape future lifestyles, societies, and economies. 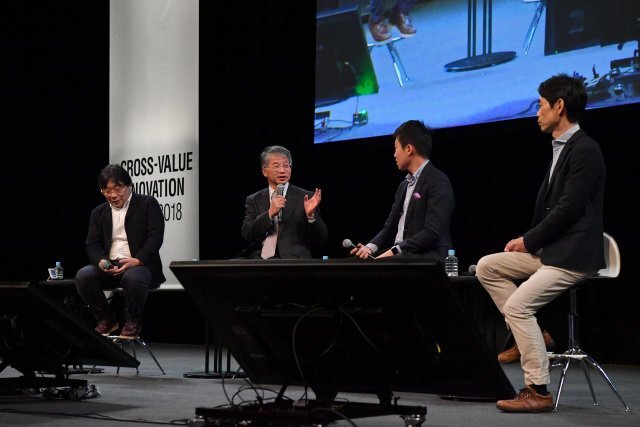 To explore the possibilities, experts from academia, business, and tech journalism gathered at Panasonic's Cross-Value Innovation Forum 2018 in Tokyo to discuss "The Future of Mobility." Tomohiro Nakamori, moderator and fellow at Nikkei BP Intelligence Group, opened the discussion by asking panelists, how will mobility evolve over the coming decade? Tsubasa Nakamura, co-representative at Cartivator, a volunteer organization that aims to light the Olympic torch with a flying vehicle at the 2020 Olympic Games in Tokyo, offered a vision. He pointed to ways advances in mobility will benefit communities, help in emergencies and bring changes to logistics. Flying machines like drones have already become somewhat commonplace, but they will be a way of life in the cities of tomorrow. "By 2025 flying cars will likely be able to provide services in certain countries. We are likely to see more personal usage in limited regions in just the next three years," Nakamura predicted. He went on to predict changes to the way people work, live and play. "People will be able to afford to live further away from cities due to flying vehicles," he offered. Logistics will improve with advances in mobility, and those living in remote communities will have better access to fresh food and supplies. "People living on remote islands usually stockpile things for fear of ship deliveries being cut off in rough seas. But with future airborne delivery options, they will gain access to food and other necessary basics without having to worry," he suggested. Developments in mobility will also help in emergencies. Nakamura said advances in mobility can help save lives in a major disaster like an earthquake. "If that happens, the usual modes of delivering aid will be problematic. Flying vehicles can overcome this barrier and help fly emergency personnel or supplies to those in need." He cited U.S. startup Zipline, which already uses drones to deliver medical supplies to remote areas, as an example. But with tech advances come societal questions. Based on his research, Nihon University professor Haruo Ishida believes that tech, such as electrification, will evolve and so will society's response to future developments. What's important is how these new technologies will be accepted by society." Ishida wonders if people will truly accept autonomous cars, and how their views will affect policies and regulations. "The sentiments of both people and institutions will evolve, so these issues must be carefully considered," he said. Professor Ishida sees positive and negative impacts from tech advances. For instance, people trapped by inconvenient public transportation will have new ways to get to work or play. And he suggests rising emission levels, which may actually discourage people from traveling, could fall. Tech developments in mobility, such as autonomous driving, may also bring advantages to aging drivers. "The elderly in Japan will benefit greatly from this as the government is encouraging them to give up their driving licenses due to their higher rate of accidents," said Ishida. Ishida also cautioned of downsides and difficult questions related to the ownership of flying or autonomous vehicles and issues of inequality. "If we are not careful, we might end up with a society where the rich are taking the flying vehicles and the poor are stuck with traditional modes of transport," Ishida said. Yoshiro Tsuruhara, Representative and Technology Editor of AutoInsight, said exciting projects are already taking place that are impacting communities and how people interact with one another. He highlighted initiatives around the world, such as Sidewalk Labs, an affiliate of Alphabet, which is designing a district in Toronto with features like autonomous transportation. Tsuruhara believes this will lead to changes in consumer preferences. "Potential new services like automated food delivery will broaden and enrich the variety of customer experiences," he said. "The market's definition of value will change, leading to a more complex logistics landscape." Professor Ishida described how Helsinki is rolling out Mobility as a Service, integrating trip planning, booking, electronic ticketing, and payment services across all modes of transportation. As the discussion ended, he left the audience with some final thoughts. "Humans are social animals and happiness is a very important thing," he said. "Mobility can help improve lives with more convenience and impact the way people connect with each other." Mr. Tomohiro Nakamori, Fellow of Nikkei BP Intelligence Group, Nikkei Business Publications, Inc.
Mr. Yoshiro Tsuruhara, Representative of AutoInsight, Inc.